Cadets volunteer and former Phantom Regiment member Andrew Buikema submitted this photo and caption. 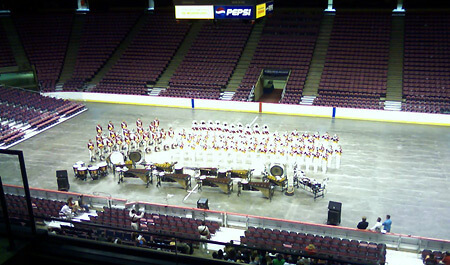 This is a picture of the Cadets' performance in the Continental Airlines Arena in New Jersey where Youth Education in the Arts hosted "The Roast of Corps Director George Hopkins," a celebration of his 25 years with the Cadets' organization. The corps members played highlights from their 2007 show, along with some all-time favorite Cadet selections.